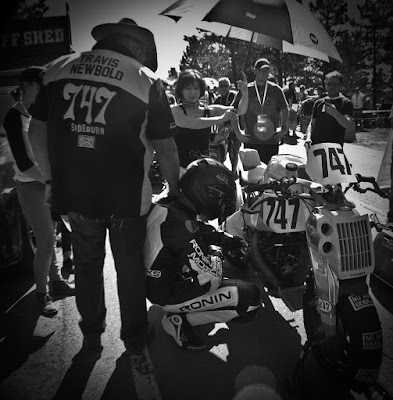 Last Sunday Sideburn's poet, Travis Newbold was preparing to race the 1190cc Ronin race special up Pikes Peak. Below are his thoughts, but first a bit of background (some of which has been covered before in the 5000-plus posts on this blog, so sorry if you know it already). I first met Travis at the Las Vegas indoor short track races in January, 2010. He stood out, because he has the roughest bike, biggest smile and a dog named Baja. I didn't realise this was Travis's first ever dirt track race. He did well, I took some photos, made a short interview and he went in the magazine. Then, through the wonder of blogs, he became friends with Anthony Co-Built, kept in touch with Sideburn and planned to visit Europe to race and tour about. He's done that twice now, plus I stayed with Travis and his wife, Rachel, when I visited Denver in October 2014 (Travis even said my off-the-cuff advice gave him the confidence to ask his now wife to start dating!). Travis started posting some poems on his blog (747 Rider). We liked them and Sideburn started running them in the magazine from issue 13, always with a shot of Travis in action or hanging out at a race. 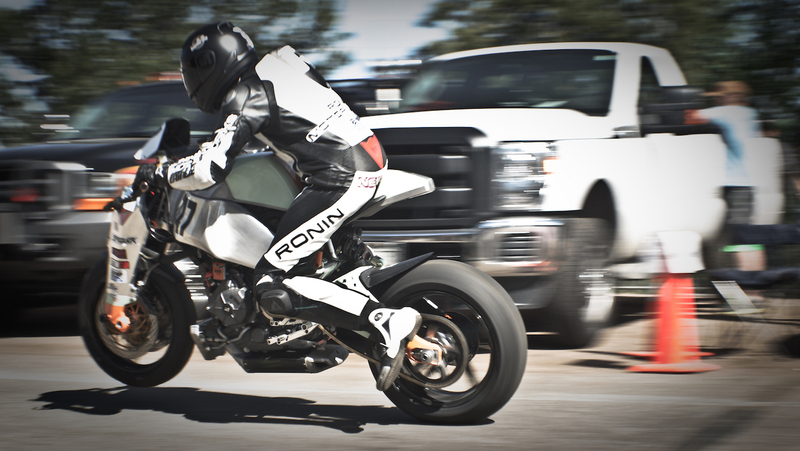 When I visited Denver it was to ride the Ronin. 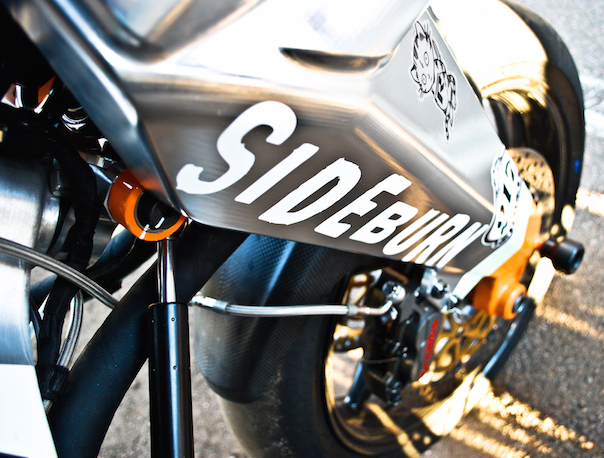 The feature went into Sideburn 19, and while I was there I suggested they should race the bike at Pikes Peak. It's one of the few races specials can compete in. My thinking was Colorado race, Colorado bike (nominally), Colorado rider. 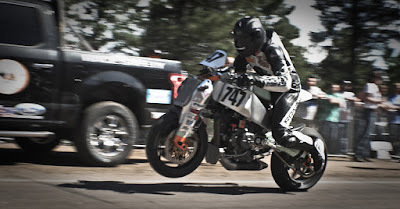 I suggested they contact Travis, a Pikes Peak regular, class winner and local bike shop owner. A couple of people at Ronin already knew of him. The two parties got in touch and the result was a well-supported effort, two trips to the mountain to practice prior to the race itself and a very excited Travis. 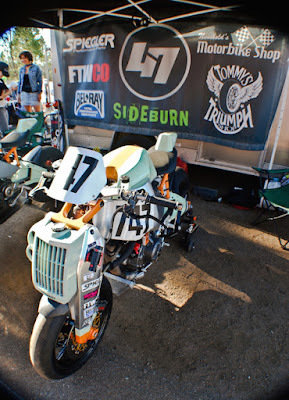 Travis kindly plastered Sideburn's logo on the team shirt's, backdrop and one of the bike's cast alloy, front girder fork legs. Very sadly, one of Travis's best friends, and an absolutely lovely fella, Carl Sorenson (217), died during the official practice, in the days before the race. Carl's family encouraged Travis to keep racing, and, somehow, he got in the frame of mind to do it. Travis and Ronin came second overall to a Honda America-supported, HRC CBR1000RR. 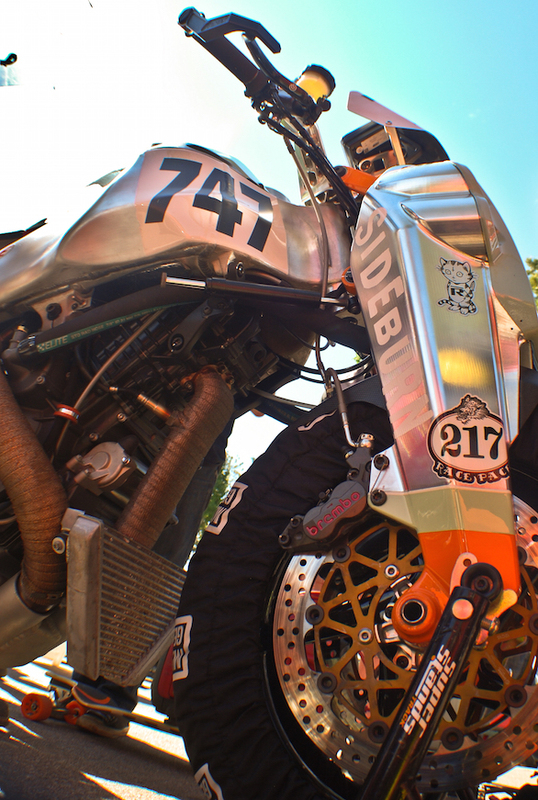 An incredible result for a bike with radical front suspension in its first ever race. It was a crazy week. Despite loosing Carl I felt solid. But as soon as the green flag waved and I went to launch the angry warthog into warp speed I knew it was going to be tough to make it to the top. In an effort to not over heat the bike we started with a cold engine. 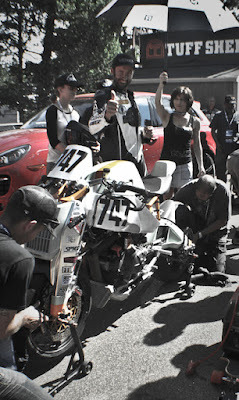 It would not take throttle for the first mile or so and once it did take throttle it nearly spit me off as the rear tyre was struggling despite having our own tyre guy. It bucked me over the highside so hard, I have no clue how I held on and saved it. It did it nearly every time I gave it any throttle coming out of a corner. In one corner I had to stand it up and ride into the drainage ditch. I kept it pinned. Then just below Devils Playground it over-heated and went into limp mode until cooling down coming into Bottomless Pit. I hammered on. Near the top I approached Carl's corner and fought so hard to keep the throttle twisted. I crossed the line and went to slide a broadie on the last dirt corner. Bar lock. No steering. I high sided the high dollar machine but at least I was in the background of HRC rider Tigert [and racewinner] giving his TV interview. I stole the camera's attention. The Ronin crew were all so supportive and never once put any kind of pressure on me. Everybody was impressed with each other and so many people came together. It was amazing. Leaving the start with Rachel and Lacey [Carl's widow] standing together was something I will not forget. It has me thinking that 8 years and 6 trophies on the hill is enough. Time to go do something else. 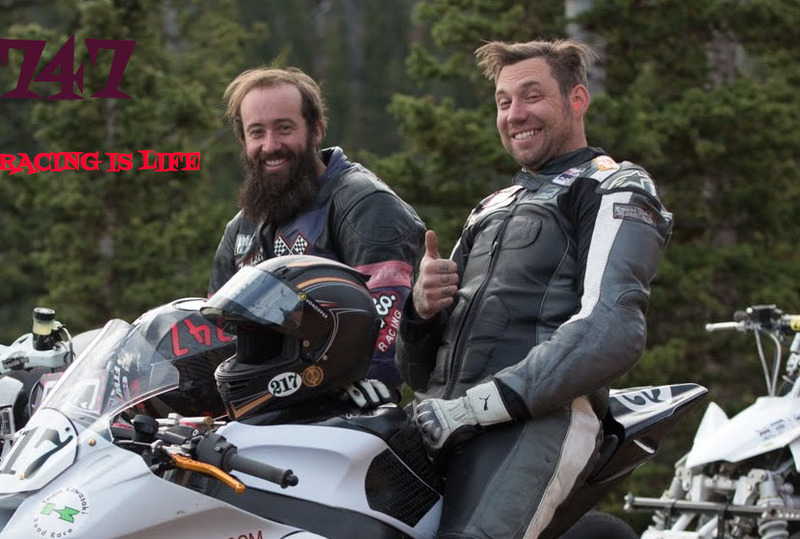 Life is short and adventures should be many. Friends and family are so dear. I have so much respect for life. It is hard to put into words. It is a matter of keeping the balance. 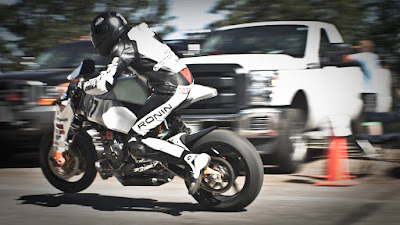 I know Johnny and Dusty [at Ronin] really want to build me another race bike of some sort for me and Mike Mayberry [Ronin co-founder] was very impressed by me, even after crashing in victory celebration, so hopefully I can continue my foray into tarmac racing. But in the meantime I am heading to the dirt ovals and that is something I know I will always be fond of. Thanks again for igniting the whole amazing adventure. A perfect epitaph. Well done Travis you legend. Thanks for the post, T and the set-up and back story, G. I had to follow the race online, but the description of the run up the hill and what I was imagining as it happened mesh perfectly. See you at the track, and RIP Carl. Thanks to everybody around me. Who we surround ourselves with is so important and without the bond there would be no build. I see Mike has been talking about that desert race/ride again, thinking about giving that tall Yamaha a go again? Amazing result with all those bike problems during the race! Sad to hear about the friend.